If you lose a tooth or restoration, have a severe toothache, or break a denture, do you know what to do? Your first action should be to contact your dentist in Federal Way, Dr. Drew Beaty. He and his team are available to advise you and stabilize your condition until you can get to the office. To be prepared when the sudden, urgent dental problem occurs, read here about some common emergency situations and what you can do immediately to help yourself or a loved one who’s hurting. Your Federal Way dentist, Dr. Beaty, defines a dental emergency as a situation that cannot wait for treatment. It may involve oral trauma, such as a blow to the mouth from a car accident, or it may involve serious pain, or dental sensitivity, as happens with an abscess. Profuse bleeding or dramatic alteration in the appearance of your smile (you lose a crown) also constitute dental emergencies. Dr. Beaty and his team urge you to contact their office right away with any pressing oral health concern. Their priority is your well-being and comfort. They will advise you on dental first aid to stabilize your condition and also arrange a same-day visit if warranted. Here are some examples of dental emergencies. Foreign object caught between your teeth Try gently dislodging the material with dental floss. If you cannot, contact Dr. Beaty for the next steps to take. Knocked-out tooth The American Association of Endodontists, specialises in root canal therapy, say that a lost tooth may be replanted successfully within an hour of injury. Grasp the tooth by the crown (top of the tooth), rinse off any dirt or debris and place its roots down into the empty socket. Hold it in place while traveling to see Dr. Beaty who may splint it to adjoining teeth or perform another restorative treatment depending on the damage. If you cannot replant the tooth yourself, keep it moist by putting it in a plastic sandwich bag with water or milk, and bring it to your dentist. Cracked tooth or lost restoration such as a filling or crown Save any fragments in a sealed container and bring them to the dental office. Put orthodontic wax or denture adhesive over the jagged edges of your tooth. Dr. Beaty may use composite resin to bond the pieces back in place, perform root canal therapy or install a crown or porcelain veneer as needed. Fractured or displaced jaw This is a medical emergency. Go to the nearest hospital ER for immediate treatment. Bleeding If you have suffered an oral laceration, place firm direct pressure on the wound with a sterile 4×4 or clean cloth. If bleeding does not stop within 10 to 15 minutes, go to the emergency room. 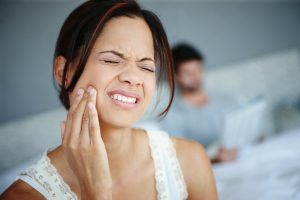 Severe toothache If you experience dental pain, swelling of the gums and/or jaw, have drainage or extreme sensitivity to hot, cold and pressure, you may have a dental abscess or infection from deep decay. Apply a cold compress to relieve swelling, and take over the counter ibuprofen or acetaminophen for pain. Contact the office for an appointment. Compassionate care when you need it–that’s what Dr. Beaty and his staff provide their patients every day. When you’re worried about your oral health, please contact Drew Beaty DDS right away for the best resolution to your problem.